If you're looking for something new and exciting in the world of fitness, you're in luck - there is no shortage of trends that are changing the way people work out. Brooke Budke, spokeswoman for TITLE Boxing Club states, "Given the number of hot new fitness trends, boredom is no longer an excuse for not exercising. In fact, due to creative thinking on the part of cutting-edge fitness professionals, you're bound to find a fitness program that suits your movement style and music preferences. Some of these programs are fun and some are downright weird. Fortunately, most are pretty effective." If you dread exercise because you envision yourself on a treadmill for hours, it's time to rethink your idea of working out. Check out some of the hottest trends in fitness and give something new a try. A high-energy cardio workout, Pound combines invigorating cardio combinations with drumsticks specially designed for the class. This group fitness format is quickly making its way into gyms across the United States. Participants follow the instructor's lead to 'pound' their way through the workout, drumming along to the beat and burning an impressive number of calories. The class is typically 45 minutes long and is appropriate for most fitness levels. No drumming experience is required. Bodyweight training utilizes nothing but your own body weight to help build up your strength, so it is definitely affordable. "Bodyweight training is popular right now," says Felice Kosakavich, fitness expert and Chief Clinical Dietician of Cassena Care in New York City. "It popular is because you can do it almost anywhere. Cost-conscious weight loss options aren't easy, so think about a workout of push-ups, sit-ups, lunges and planks. You can do them at home, a park, a break room at work or at a friend's house." Work out anywhere, any time with any of the many fitness on demand formats available. "Many cable providers have on-demand programs with different exercise and workout routines in levels," says Kosakavich. Services like Daily Burn allow you to stream a huge variety of workouts using your phone or tablet. Some gyms have even started offering Fitness On Demand and other products that allow users to play group fitness classes on a big screen, essentially giving the user control as to what class they take and at what time. Boxing has been around for a long time, but it's only recently that this workout has become a popular mainstream workout, particularly for women. "In addition to optimal physical results, boxing creates a sense of empowerment for both men and women," says Budke. "Whether it be from the physical changes or the increase in confidence, boxing as a workout appeals to both sexes." Budke adds that boxing can also be a great stress reliever. "Hitting the heavy bag at our clubs can release tension and aggression for both men and women, leaving them feeling empowered after a workout," she says. Fitness apps for smartphones and tablets are making a huge impact on how people stay fit. 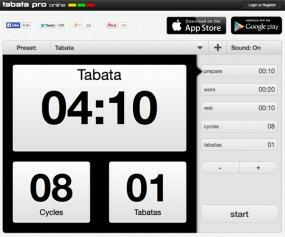 Whether you want to track your calories or use a timer for tabata workouts, there's an app for that. "There are so many apps to download that it may take you a while to find out which one you like best," says Kosakavich. "Many fitness apps also can attach to equipment at gyms to track your personal goals for weight and health." Getting fit isn't just about breaking a sweat these days, with more whole-body wellness routines coming to gyms and hitting the store shelves as routines that can be done at home. One example is the MELT Method, which was originally created by a manual therapist to help clients work toward relieving their chronic pain at home in between office visits. Now MELT classes are offered in group settings or can be done at home using the at-home kit, which retails for around $50. People who don't like leaving their four-legged friends at home to go to the gym will be thrilled to learn that a hot new fitness trend includes their dogs. Exercise programs designed for people and dogs to work out together are popping up with franchises like Zoom Room Dog Training. 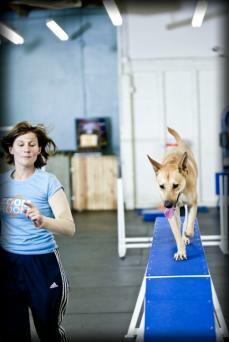 These workouts allow owners and dogs to run through obstacle courses together, getting a good workout and having fun together. Soon to expand nationwide, Spiderbands is a group fitness class that involves the use of long, durable resistance bands hanging from the ceiling that are used to create a "total-body cardio resistance workout." The bands are used in a variety of group fitness class formats including spinning, kickboxing and more. The bands allow you to use your body weight to add resistance to whatever exercise you're doing, transforming any class into a full-body workout. A rapidly growing trend with fitness gear is to make it more stylish, with many retailers offering fitness clothing that can double as streetwear. JWalking Designs sent me a couple of their fitness fashion items to try out, and I found both of the pieces to be not only extremely comfortable throughout my tough workout, but they were very flattering as well. Whether you're looking for a kilt to wear in a mud run or you want an active skirt that will look just as good at the gym as it will when you are running errands, fitness fashion is making an impact. Activity tracker bracelets have rapidly been increasing in popularity, but wearables are also evolving into other forms such as necklaces, shoe attachments and more. Activity-tracking clothing - called 'smart fabric' - is already in use for coaching and training, but it won't be long before it's available to the mainstream market. Explore all the different fitness trends in order to find the most effective end enjoyable method for you to stay in shape and enjoy getting fit. "Choosing exercises or workouts that fit with your physical skill level and ability and gradually increasing the intensity and frequency are the key factors for success," advises Budke. She continues, "Don't try to jump into a workout that you aren't ready for, but rather choose one that fits your ability and has the capability of becoming more intense as your fitness level improves." Of course, as Kosakavich cautions, "Any type of exercise should be started slowly and under the advice of your medical professional."